Use R2 to investigate the expression levels of all samples from a specific dataset. In this example the expression levels of the MYCN gene will be used. Adjust several parameters in the advanced settings panel to get a better insight in the expressions levels or adapt your graphic layout. In R2, the samples are annotated with e.g clinical data, each group of annotated data is called a “Track” in R2. 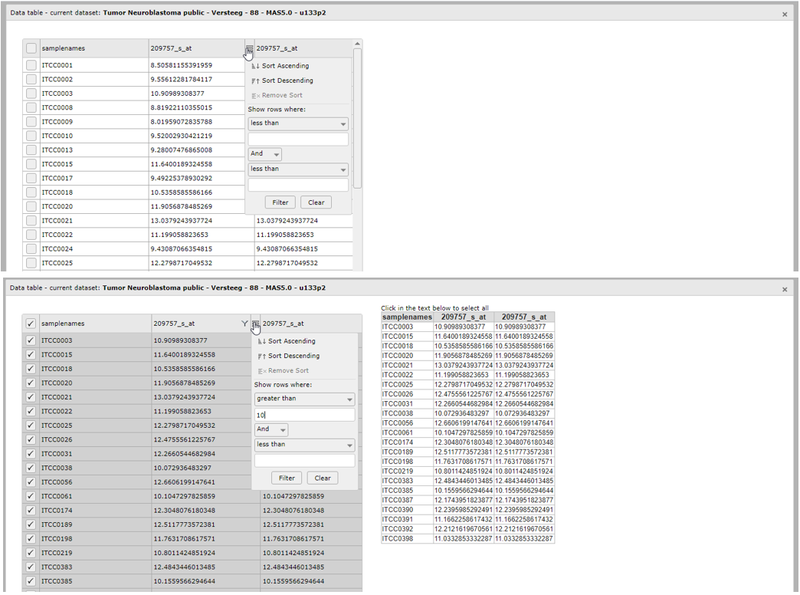 These tracks can be used to filter data in all types of analyses R2 is offering. A separated info panel in the one-gene expression level screen provides different types of analyses based on the expression level of the chosen gene. Most of the mRNA expression datasets are generated with Affymetrix profiling arrays. In general these arrays use more than one so called probeset to measure the expression level of one single gene. With a separated module “Transcript view”, the details of the probesets can be studied. 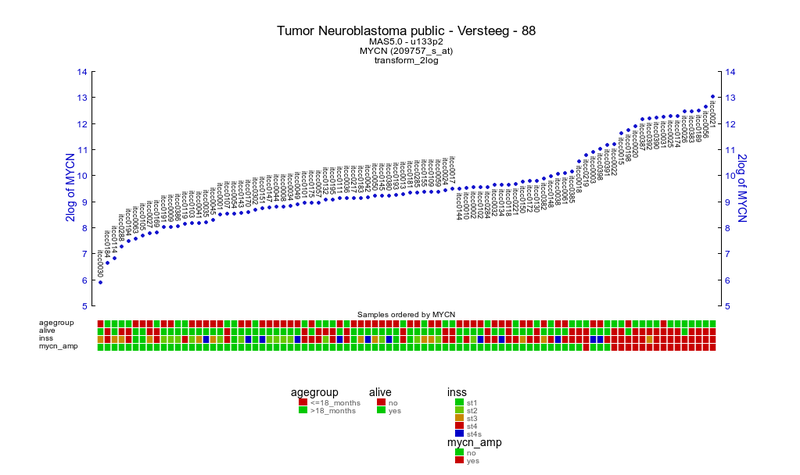 Use “Single Dataset” in field 1 and make sure that the “Tumor Neuroblastoma public - Versteeg - 88 - MAS5.0 - u133p2” dataset is selected in field 2. Choose “View a gene” in field 3. Type MYCN and click ‘next’. In many cases more than one probeset is reported for each gene. In this example, there are 5 probesets annotated for the MYCN gene. By default, the probeset with the highest average present signal (APS) is selected. This APS signal is simply the average of all samples that are considered to express a selected gene (have a present call). Occasionally other probesets assigned to the same gene could be of interest depending on the structure of the gene (for example a potential splice variant). Also realize that the most informative probeset is re-determined in every dataset, sometimes resulting in a different probeset as the choice of R2. The expression levels are by default converted to log2 values. In the adjustable settings screen, use the pre-defined default settings and click ‘Next’. Did you know that a reporter with an exclamation marks is an indication there may be something wrong with the reporter (e.g. bad design)? Hovering over the exclamation mark will inform you on what may be theissue with a specific reporter (probeset). Reporters with an issue willnot be used to represent a gene in searches where hugoonce is used.Hovering over the name of a gene will display concise gene information,such as alternative names for the current gene. In case you are notsearching with an official NCBI genesymbol, R2 will also search thealternative names to find your gene of interest. R2 generates a YY-graph Figure 3 from the MYCN expression levels of all samples with expression levels ordered from left (low) to right (high). Hovering over the dots reveals additional annotation that R2 has stored for the focused sample. Sometimes you get more insight by reviewing the expression levels with other transformations. Scroll down and transform the data (Figure 5), choosing “none”, in the ‘transformation’ pulldown menu and click adjust settings. 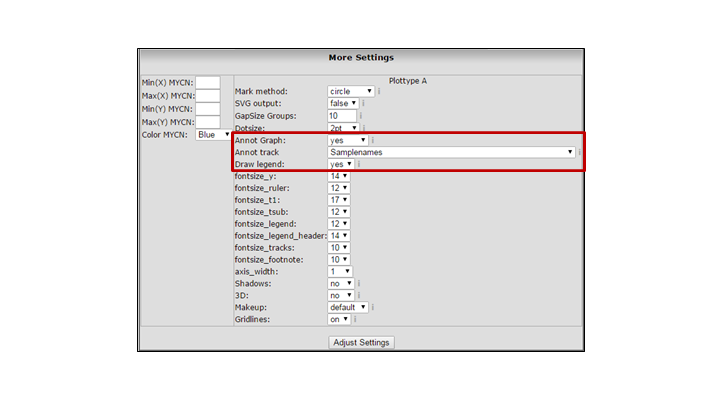 In the “adjustable settings” panel, there are several other settings to adapt the graph R2 generates (like changing font sizes, or adding labels to the datapoints). Did you know that the Adjustable Settings panel is available under most graphs in R2? Just scroll down the page to find the Adjustable Settings box with graph options. Don’t forget to press the “Adjust Settings” button at the bottom of the box in order for your changes to take effect! To highlight / mark specific samples in the graph you can enter the R2 sample ID’s in the field ‘samples to mark’ from the ‘adjustable settings’ box. Several marking options can be selected with the ‘Mark method’ that can be found in the ‘More settings’ tab (e.g: ‘epicenter’ and ‘arrow’). Did you know that R2 allows you to emphasize samples with marker options? Note: The dotsize does not scale with ‘arrow’ and ‘triangle’ method. Multiple colors and different markings can be applied to the individual samples you want to highlight. To bring attention to different samples, you may want to use multiple colors and types of marking. In order to do so define the method within the ‘samples to mark’ box by adding another ‘:’ after the color representation. Defining this will overrule the default setting, and thus also enable the use of different markings within the same figure. The skeleton for advanced usage is: ‘sample1,sample2:color1:method1;sample3,sample4:color2:method2’. For example: ‘“itcc0288:ff4444:dot;itcc0021:009999:arrow;itcc0013,itcc0132:00ff00:epicenter”’ creates the markings as shown in the figure below. Did you know that converting expression levels using the “transform” option can help you to gain additional insight? “none”: Raw untransformed expression values, as they are represented in the R2 database. “2log”: logarithmic values with base of 2. Every incrementconstitutes twice the amount. “rank”: Data transformation in which numerical or ordinal values are replaced by their rank when the data are sorted by expression. Thistransformation is useful for non-parametric statistical tests. “zscore”: 2log transformed data, centered around the average andexpressed as the number of standard deviations from the average. “zscore_nonlog”: raw intensity values, centered around the averageand expressed as the number of standard deviations from the average. This transformation is useful when the intensities in R2 are not raw, but for example logfolds as is often the case for aCGH data. “mad/mad2log”: Median absolute deviation (on raw values, or log2transformed values). “center/log2center”: Expression values centered around 0 (on rawvalues, or log2 transformed values). “zcore_group”: Coverts the expression levels from the zscore within a group (track). Applicable when e.g technical variation inexpression levels is expected. A possible reason could be whensamples from the same dataset originate from different centers. Figure 6 lists for the various reporters of MYCN whether they are in agreement with the genome position of MYCN reference sequence (RefSeq). If all are stating “YES” then everything appears alright (from the perspective of an automated assessment). For the MYCN reporters “NO” indications indicate there may be an issue with it. Scroll down the page and click on the “Tview” link in the reporter table. A new screen (or tab in the browser) appears with TranscriptView. The TranscriptView application depicts the alignment of expressed sequence tags (EST) and mRNA sequences to the human reference genome sequence (Fig 8. The strand orientation of these sequences are indicated by a color (green = positive strand, red = negative strand, blue = strand information is missing). The structure of the reference sequence has also been indicated. Furtermore, the browser shows the alignement of the sequences that were used to generate the reporters on the array (in the case of Affymetrix microarrays).This view can be used to inspect the quality of a reporter. Note, for instance, that the reporter “242026_at” is aligned to the genomic region of the MYCN reference sequence, but that it’s color is different from the rest (colored in red). In addition, in this particular case the reporter is located in the intronic (light shaded color) region which is another reason not to pick a certain probeset. Indeed, if we compare the gene expression values of this reporter, then its expression is 60 fold lower than R2’s standard pick (22 vs 1369). Below the ESTs the average gene expression of the individual probesets is illustrating that for this example the correct probeset is selected for analysis. NB: Currently probeset verification is only provided for various human Affymetrix array types. Did you know that you can browse the gene expression values along the genome? Once you have entered the genome browser with an attached dataset (like above), you can also navigate to / zoom out any other region in the genome. This allows you to look at the neighboring genes in a single go. It can be informative to separate the expression on the basis of a track. This can be achieved by selecting ‘dataset_track’ from the sample dropdown in the middle panel. Finally, within the genome browser, the contents for a panel on the left side can be hidden from a view by setting the height to 0. 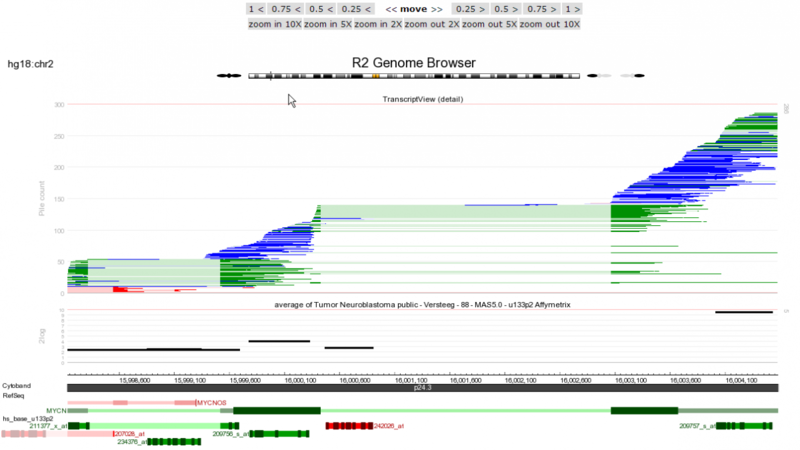 Close the Genome Browser tab or go back to the MYCN One Gene View expression screen. In the left upper menu-panel several options are available to provide you with additional information sources of the MYCN gene and additional analyses. KaplanScan and Time Series analyses will be discussed in separate tutorials. GeneCards will redirect you to an overview on your gene of interest composed of many different resources. ProbePlus, will provide the sequences probed by the U133 Affymetrix platforms (Will not be shown in other platforms). Across datasets will generate an overview showing the average expression of the gene of interest within all datasets of the same platform/normalization scheme (provided that the normalization supports dataset additions). When you click on the link (the name of the gene) under the PubSniffer header in the left menu, a new screen opens thats lists the number of times your gene of interest is found within the NCBI Pubmed database in combination with dataset keywords. Clicking on one of the “Pubreminder” links redirects you to Pubmed Pub-reminer which is a tool for PubMed query building and literature mining. Did you know that Pub re-miner is a helpful tool for literature mining? To investigate the values R2 uses for graph generation click on “Datatable” to unfold a table with the expression levels for all samples. 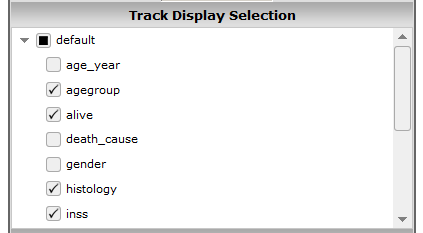 The “track display selection” section can be opened by clicking on it. In here, you are able to toggle which tracks to display and/or hide within the YY-plots. Do note that these selections are non-persistent and will be forgotten as soon as you leave the xgeneview. Persistent, changes to the tracks can be made via the ‘my settings’ menu item, which is present in the main screen. Note that the adjustable settings panel including the customize track parameters are available throughout R2. Other convenient options are revealed by clicking the “more settings” section. An extra panel unfolds which allows you to adapt your graph to meet for example the requirements of a journal. The appearance of this section will change depending on the kind of graph that you are selecting. In Figure 12 sample annotation (“Annot Graph”) and legend (“Draw Legend”) were added. The “Annot Graph” option, adds the information of a selected track to the YY-plot. This can be helpful for the addition of Sample labels, or cell line names etc. Annotations can be shown in 3 ways; just below/on top of the expression value, as a series below the annotation tracks or at the values for those samples that haven been marked. The size of the annotation scales with the setting of the dotsize.Check the More Settings panel for extra options, such as changing the color of the axis or showing link to and SVG output image. The Adjustable Settings menu is available in most of the R2 modules where a one-or two gene view is generated. Thus far, we have been looking at the expression of MYCN ordered by the expression. From the current location, we can also inspect the MYCN expression sub divided in groups. To achieve this, we simply scroll to the end of the page and locate the dropdown box in the ‘Group Separations’ section of the ‘Adjustable Settings’. Here we can select a track to separate the cohort accordingly. Select ‘inss’ as a track and press the ‘Adjust Settings’ button at the end of the page. R2 has now separated the patients on the basis of the inss staging track in alphabetical order. The current representation is the most honest way of showing your data, as every single value is visible in the plot. We can also change the graphical representation of the data by selecting another graph type. Select ‘boxplot’ from the ‘graphtype’ dropdown and change ‘color by’ to ‘color by track’. Press the ‘Adjust’ button again to change the view. We now obtain a boxplot image where the respective groups have been colored according to the groups. Adaptations to other graphtypes can be made in a similar way. You can also sort the groups by their average or median gene expression. Did you know that once you separate a dataset in more than 2 groups, R2 will identify the most significant pair? *If you view a gene in groups within the one-gene-view view page and the number of sub-groups are greater than 2, then R2 will automatically perform a brute-force t-testing to identify the combination of 2 groups that have the most significant difference. Just click on the ‘T-test on combinations’ link underneath the image and gain insight into all the tested combinations. To generate a graph of a subgroup of samples use the ‘Select a track’ pulldown from the ‘sample filter’ section to select a specific group. 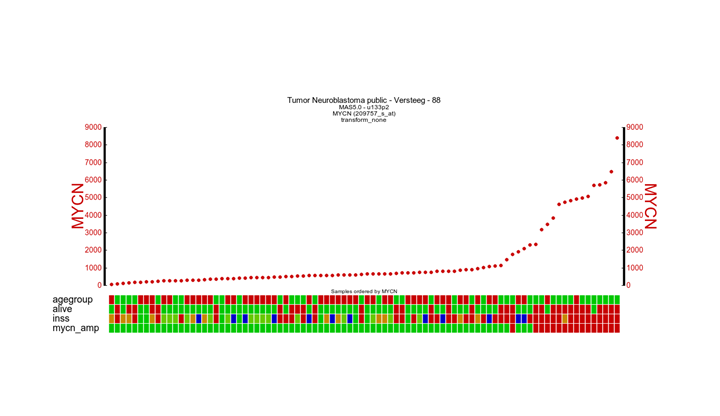 In the neuroblastoma field it is well known that the mync expression is strongly correlated with stage 4. But maybe you are also interested in the mycn expression for the lower risk stages. Go to the Adjustable Settings menu and select in the pull down the INSS stage. In th epopup window select the lower risk stages st1,st2,st3 and st4s and click Next. Back in the Adjustable Settings panel click on the Adjust Settings button. These selections can be repeated a couple of times to build your ultimate selection. In the picture below all stages are depicted and only the lower risk stages with Graphtype BoxDotPlot. You will encounter the filter option in the adjustable settings box in many modules. We could wonder if our gene of interest associates even more with any annotation that is already available for the current dataset (like e.g. age group) than the example in the previous section. For such an analysis R2 has the CliniSnitch function. Within this functionality a brute force T-test is performed on every possible combination of subgroups within every annotation track. 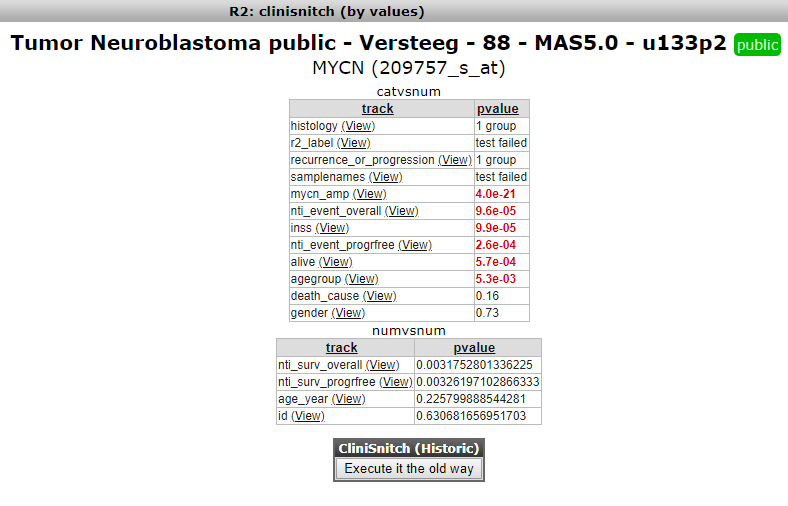 We can run a CliniSnitch analysis directly from the one-gene-view page by clicking on the Gene name under CliniSnitch in the left panel. Click on the ‘MYCN’ gene. For every track, the most significant test will be highlighted. Every test can also be visualized by clicking on the combination label. Not surprisingly, we can see that MYCN expression is best separated by the MYCN amplification track. If we look at the ‘inss’ track, we can also see that nearly every test containing ‘st4’ has a significant value. Click on ‘st2 vs st4’ to inspect this further. We are now back in the ‘one gene view’, but our dataset has been restricted to only those patients that belong to either st2 or st4.